On one side, a stone symbolizing strength. On the other, a word you want to keep close. There's a lot of power in this petite pendant. On one side, a stone symbolizing strength, grounding, and protection. On the other, a word you want to keep close: Intuition, Love, Strength, or Balance. Wear it either way as you set out to seize the day, whether that means waffles or world peace. Fourteen-karat gold-dipped brass. Handmade by friends Lauren Swanson and Amy Makkabi in Los Angeles. Lauren Swanson and Amy Makkabi describe themselves as "two friends who share a magical bond." That bond, it turns out, makes beautiful jewelry. Through their simple, well-made pieces, they hope to provide "strength, connection, and pretty things for your mind and body." Lauren and Amy live and work in Los Angeles. I bought one of these necklaces for my daughter and for myself. I purchased the Intuition Malachite for each of us. Upon receipt, we both think they are beautiful!! I wear mine everyday and have received many compliments. I would have given 5 stars, but the clasp is very tiny and for that reason gave it 4 stars. I need to take it in to have new clasp put on. Thats ok but it would be nice with a bigger clasp. OBSESSED with these necklaces. This is my third one. Pictures don't do it justice - the simple design and color pop of the stones are stunning. Also, THEY WORK! Ever since I got this necklace I have felt more empowered and confident. Can not suggest these necklaces enough. Even if you're not into the power of crystals -- it's really well made and beautifully designed jewelry. This is my3rd sheisme necklace and I can't get enough. The simple design and meaningful stones are versatile and look great layered. Also they WORK. I have been wearing the intuition one for over a year and have honestly had more clarity than ever before. Since putting on this Onyx one, I've felt confident and empowered, with more energy. Even if you're not into the meaning behind the stones, these are beautiful timeless pieces. So MUCH BETTER than the photos!!!! OMG. Waaaaay better than the photos. This is literally the perfect necklace. My girlfriend actually tried on the same exact necklace at a cute boutique in LA and I thought I'd surprise her by buying it online. She LOVES it. It looks great layered with other necklaces of different lengths, as well as, on it's own. LOVE the message and OBSESSED with the brand. I love my Sheisme necklace! 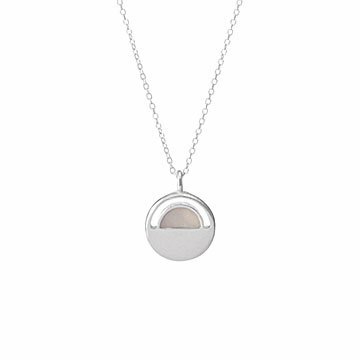 It has a beautifully delicate chain & it's minimal design is so classy & goes with everything. I can wear it with the gemstone facing out or the engraved word depending on what I'm wearing or feeling like. So versatile...I want one in every color and intention! I got Malachite a gorgeous vibrant marbled green with the word Intuition engraved on the back. Strength (black onyx) and Vision (tigers eye) are next on my list.